Takashi Miike's 13 Assassins opens with an austere ritual suicide beneath an overcast sky. How can a man stick a knife into his gut and barely utter a groan? That, I suspect, is the point. It's 1844, a time of peace in the waning age of the warrior samurai, and these are tough guys. After slowly setting up a complex (yet familiar) melodrama of political and class intrigue, Miike (Ichi the Killer) eventually gets to the action: Who among 13 assassins will honorably bring down a mad sanguinary shogun landlord who disarms women (literally) to have his way with them? And we thought our political system was ruthless! The acting is mannered, the dialogue is stiff, and there's a climactic death howl worthy of Bergman. 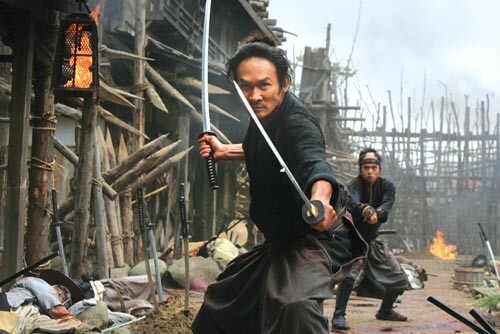 But that's not why we're here: When the swords finally begin to fly, so does the often-sluggish 13 Assassins. Filmed in shadows, sunsets and by flickering candlelight, it's gorgeous to behold, and there's plenty of anti-war bloodshed to heighten the visceral beauty. How historically accurate and culturally authentic is a film like this? We ask the same of our Westerns -- and, let's face it, we don't care what the answer is.